The Half Hollow Hills High School East chapter of DECA found success at yet another state competition! The team could not have done this without its amazing leaders, Mr. Cappiello and Mrs. Cappiello. This year’s state competition took place from Tuesday March 6 to Friday March 9 at the Rochester Convention Center. Due to the snowy conditions, the HSE DECA team was fortunate enough to have even made it to the competition, while other high schools, such as POBJFK, Smithtown East, and Smithtown West, were hindered by the wretched conditions. In order to make it to the state level, one must succeed at the regional level first. Suffolk County has its own regional competition in which we participate. For a majority of categories, students must take a multiple choice test at regionals. The participants with top 15 test scores for each of those categories move on to the state level. These categories are in clusters of Hospitality, Marketing, Business Management & Administration, and Finance. Members may take a solo test or work in a team of two. For those who move onto the state level, a multiple choice test is given at school, followed by two role plays at states for solo events and one role play together for teams. Furthermore, there are a select few events for which participants do not compete at the regional level; they go right to states. Events like Advertising Campaign, Innovation Plan, and Business Growth Plan usually consist of a presentation shown to the judges. The 38 Hills East students moving onto the state competition spent six hours on a bus before finally reaching the Rochester Riverside hotel. The convention center- where the actual competition takes place- connects many hotels including the Rochester Riverside, The Holiday Inn, and The Hyatt; each was filled with DECA students during competition week. Fortunately, this prevented many long and snowy walks outside! At the state competition each year, a new executive board to represent all of New York DECA chapters is elected. The candidate speeches were breathtaking and choosing which candidates to elect was definitely a difficult task for the voting delegates. The victors were New York State’s New President Joseph Iqbal, Executive Vice President Ali Weinberg, Vice President of Finance Luke Puthumana, Vice President of Competition Dan Smith, and Vice President of Communications Jordan O’Brien. 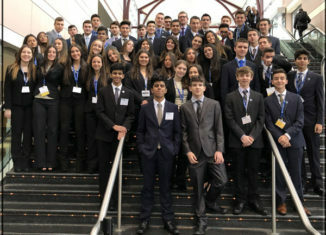 After our success at states, the Hills East DECA team is very excited to send six excelling students to the International Competition in Atlanta, Georgia. A very big congratulations to Morgan Novikoff, Sydni Berkenfeld, Brooke Blumberg, Samantha Hammer, Alec Schmigelski, and William Benai. On behalf of the Half Hollow Hills community, we wish these six students nothing but success at the next level. Our success doesn’t stop there! Many students still excelled while placing top 10 in their categories. For instance, chapter presidents Matt Shumer and Casey Goldstein developed a hypothetical app called “Digilook” for innovation plan and scored top 10 in their category. The DECA team is very appreciative of all that the Half Hollow Hills community does to allow for such an exhilarating experience of life in the business world. The team is looking forward to another year of ultimate achievement!